(Nanowerk News) The first bio-inspired microrobot capable of not just walking on water like the water strider – but continuously jumping up and down like a real water strider – now is a reality. 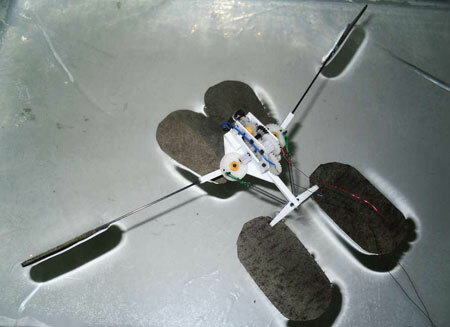 Scientists reported development of the agile microrobot, which could use its jumping ability to avoid obstacles on reconnaissance or other missions, in ACS Applied Materials & Interfaces ("Why Superhydrophobicity Is Crucial for a Water-Jumping Microrobot? Experimental and Theoretical Investigations"). Qinmin Pan and colleagues explain that scientists have reported a number of advances toward tiny robots that can walk on water. Such robots could skim across lakes and other bodies of water to monitor water quality or act as tiny spies. However, even the most advanced designs – including one from Pan’s team last year – can only walk on water. Pan notes that real water striders actually leap. Making a jumping robot is difficult because the downward force needed to propel it into the air usually pushes the legs through the water’s surface. Pan’s group looked for novel mechanisms and materials to build a true water-striding robot. Using porous, super water-repellant nickel foam to fabricate the three supporting and two jumping legs, the group made a robot that could leap more than 5.5 inches, despite weighing as much as 1,100 water striders. In experiments, the robot could jump nearly 14 inches forward – more than twice its own length – leaving the water at about 3.6 miles per hour. The authors report that the ability to leap will make the bio-inspired microrobot more agile and better able to avoid obstacles it encounters on the water’s surface.